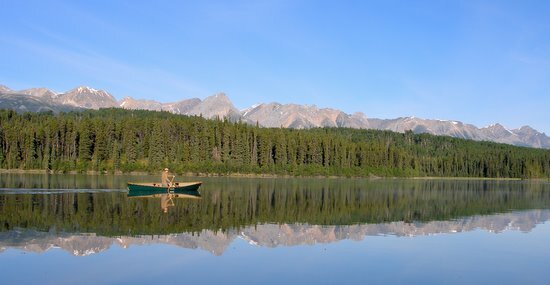 We were a week into our 12-day canoe trip down a wilderness river in northern British Columbia when I popped a “guy” question capable of spurring hours of discussion. Obviously it had nothing to do with children. 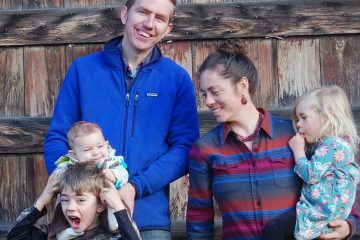 Unlike women who can spend a day discussing every nuance of a kid’s behavior, we were done with all that. In a few minutes we had covered the low-security prison where some of our children resided. A few minutes more and we were finished with the analysis of whether our darlings deserved imprisonment simply because they had accelerated before careening into six old ladies. We had also already discussed such uninteresting topics as parents with dementia who had wandered away from home and miraculously appeared months later in Italy. Now it was time for a conversation that could truly hold a man’s attention—gear talk. I asked which items brought on this 200-mile paddle down the Gataga River were each person’s favorite accessory. Instantly our sextet gave up listening to the maniacal yodel of nearby loons and zeroed in on this topic worthy of their guyness. Following are the Cliff Notes from a long, long discussion. Pros: Waterproof. Nearly knee high (you can get in and out of a canoe in fairly deep water without taking-in water over the cuff). 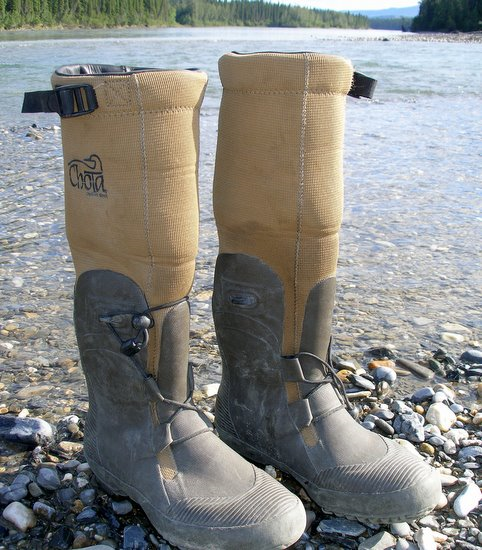 Cinch straps at the top of the mukluks keep the cuffs closed and water from slopping in when you’re wading. The same straps keep the mukluks from collecting water if you’re kneeling in a canoe. The leg-hugging cut of this product only admits about a pint of water into the mukluk if you swamp—that means the Chotas won’t become cement overshoes if you take a swim. Finally the mukluks walk well when you hike in them. Cons: Chotas are completely waterproof so your swaddled feet can get sweaty over the course of a long day. The sweat issue can also give the Chotas a ripe aroma over time—use a daily change of socks to control the stink factor. 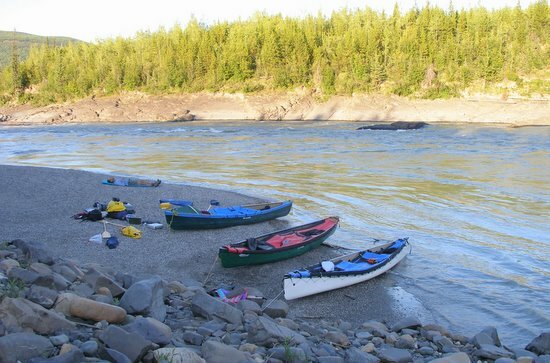 Howie Wallace, formerly an Entiat high school teacher, has completed several long canoe trips in northern Canada and many shorter kayak excursions around the Northwest. 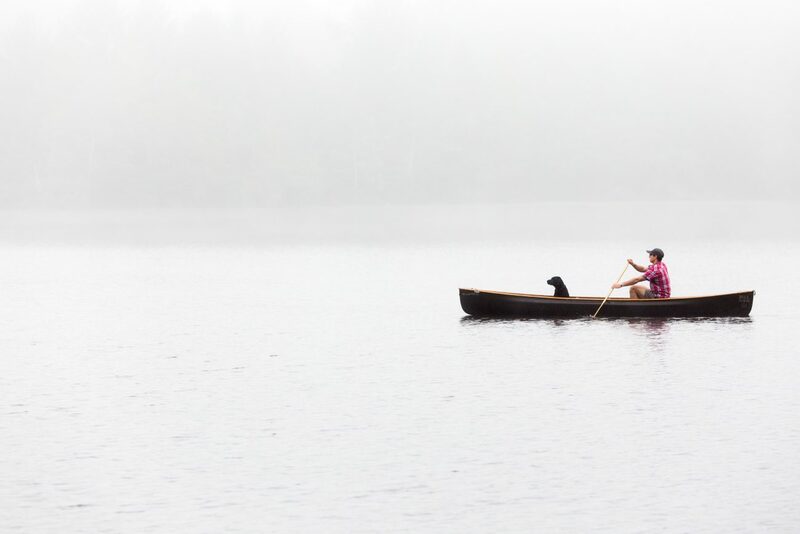 He quickly pegged his poncho as his favorite canoeing accessory. Wearing a good poncho under a life vest provides stellar rain protection, great ventilation, and excellent mobility. There is none of the confinement or sweatiness of a rain coat. Furthermore, you can cover your legs with a poncho so your entire body stays dry. And ponchos are cheap rainwear. Does rain get in around the edges of a poncho? “Rarely” Howie maintains. “When you’re paddling, your arms do most of the moving, so it’s easy to position everything to stay dry. What distinguishes a good poncho? “It should be made of coated nylon, have a few snaps around the perimeter to keep the edges properly positioned, and needs a decent hood.” Howie also likes the color black: Black hides the dirt, complements his black sombrero, and was the color Campmor (www.campmor.com) was selling for a good price. 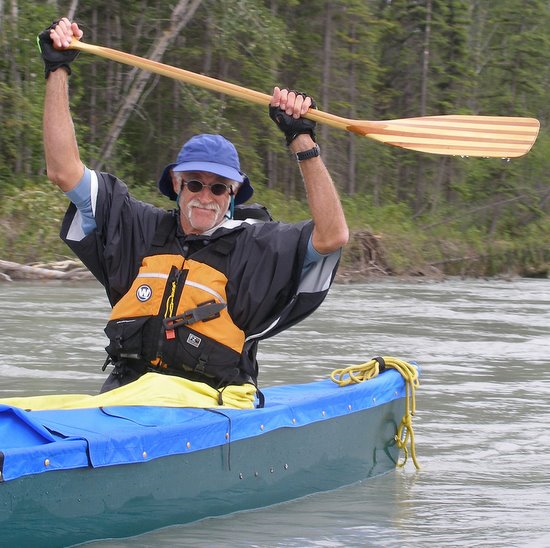 Gary Womeldorff, a mechanical engineer for Boeing, is one of the more experienced outdoorsmen in our group but our least experienced whitewater paddler. The whitewater we would encounter on the Gataga and the river’s glacial temperatures (47 degrees F) worried him, so he wanted a spray deck for his 16.5-foot Clipper canoe. Our group had considerable collective experience with homemade and custom-made spray decks – we thought the decks made by North Water (www.northwater.com) were the best available. Gary followed our advice and sent North Water the measurements of his boat. 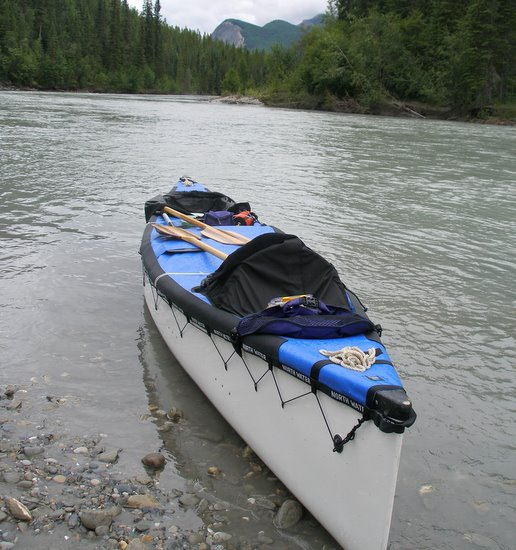 The resulting spray deck gives his fiberglass canoe, which is actually best suited for flat-water paddling, the ability to navigate Class 2 and 2+ rapids without swamping. The deck goes on easily yet its lace-up attachment system prevents the possibility of failure when waves crash over the canoe (many decks rely on snap-on attachments that can pop-off under big loads).Furthermore this deck is made of vinyl-coated polyester and does not stretch and sag like coated nylon after it gets wet. Finally the cockpits use plastic hoops to elevate the fabric and, as waves wash over the boat, big puddles are less likely to form around the paddlers. The cons of this spray deck? The $535 cost for one. Unfortunately this is not out of line with what other manufacturers charge and, if you’re going to take long trips down whitewater rivers, a spray deck is part of the entry cost. Gary also felt the cockpit design left room for improvement—he found the interface between the skirt and the paddlers cumbersome to manipulate. Furthermore, the Cordura fabric used around the cockpit has the lousy coating that characterizes most Cordura products and leaked with alacrity of uncoated nylon as we paddled through rainstorms. This nullifies what should be one of the great pleasures of paddling with a spray deck—the ability to stay bone dry below the sternum when storming through squalls. 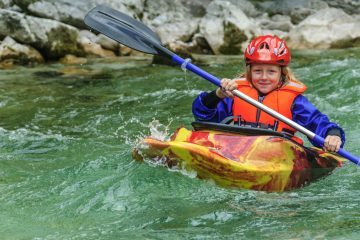 Best Canoeing Accessories – Part 2. Gordon Congdon discusses best pants, John Marshall raves about tarps and paddles, and Andy Dappen highlights waterproof luggage options. This post was originally published on 8/14/08.